Place the blackberries and sugar into a saucepan and cook over low heat, stirring regularly, until the blackberries collapse into mush. Stir in the vinegar, then add the stock, orange zest, and cinnamon. Bring to a boil, and simmer for 25 minutes. Add the wine, and simmer for another 5 minutes. Pass the sauce through a chinois, and reserve. Before serving, reheat, and whisk in the butter. Season with salt and cayenne pepper. Bring the water and salt to a boil in a saucepan. Add the polenta, cover, and cook over low heat for 30 minutes, stirring every 5 minutes or so, and adding the butter at midtime. When serving, cut the sulguni into cubes or batons, and stick the cheese into the polenta. Finish with a little bit of black pepper. 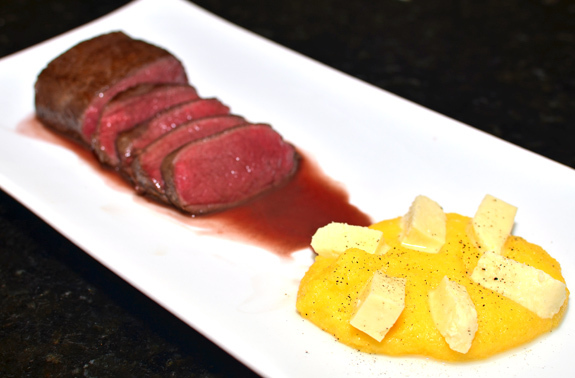 Cut the venison loin into 4 portions, and season with salt on all sides. In a pan over high heat, sauté the meat in the canola oil until brown on all sides (you’ll probably have to proceed in 2 batches). Remove from the heat, and let rest for a few minutes. Transfer the meat to an oven-proof dish, add the butter slices on top, and cook in 250 F oven to the desired doneness. 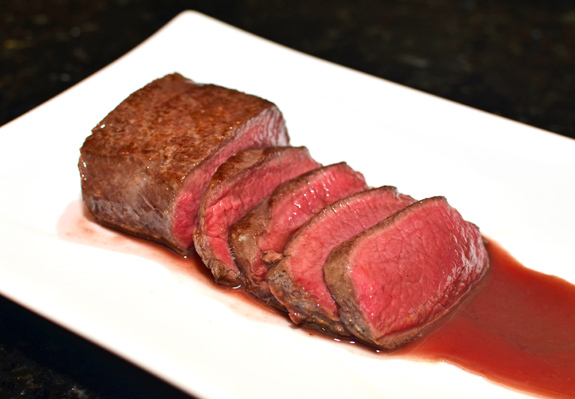 If you like your venison rare, take it out of the oven when the internal temperature reaches 125 F. Let rest for 5 minutes. Slice thinly, and serve. You can also mix the juices from the oven dish into the blackberry sauce. Thanks for the nice recipe. As usual your blog is very interesting. Elardji with smoked sulguni is even better in my opinion. Looking forward for new recipes and information about the Caucasian food traditions. Can you recommend an English written professional Caucasian/Russian cook book? Hi Mark, I have 2 Georgian cookbooks written in English: The Georgian Feast, and The Classic Cuisine of Soviet Georgia.